"Can you wait (pray) with me for an hour? "this question is still one of our greatest challenge for today. We therefore have set aside time during the month.
" Watch and pray "
Monthly – Intercession and prayer night on the first Thursday of each month at 19:00pm. • Wavering faith. Doubts about God's character or dependability diminish our trust in Him. Therefore, we must not allow feelings to dictate what we believe. • Wrong motives (James 4:3). Petitions motivated by selfish desires won't receive an affirmative answer. God wants us to pray for His will to be done--not ours. To develop a strong prayer life takes effort and commitment, but the rewards are great. If your prayers have not been answered, consider which, if any, of the above issues may need correction. Then, start by personalizing the prayers you read in the Psalms or elsewhere in God's Word. 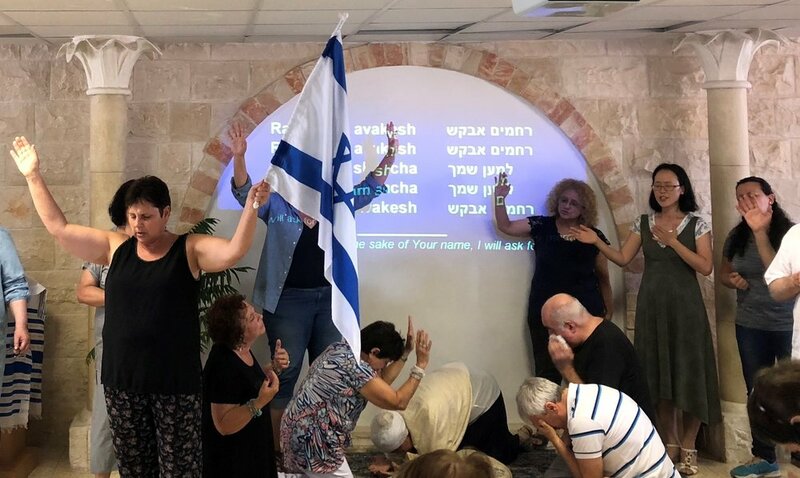 · For God to raise up intercessors for the spiritual warfare which is continuously rising now in the Middle East, that they may have supernatural wisdom & will pray according to His heart for every nation and every Ethnical group. · For protection for our nation & people. Protection over our northern borders as well as the Gaza strip. Protection from the Iranian's threats. · For the heads of government, that they understand the essentials spirituals issues of our days and that they receive the fear of God, not the fear of men and of men’s opinions. · For the nations to receive a revelation of the war that the enemy is leading in Europe, for them to realize the ploys of Islam and the way the Islamist leads their terrorist attacks in all the democratic nations. · For the media to just report the facts and not their personal opinions, twisted by their nearsighted views. · For the elections for our new government on April 9th 2019. · For our Knesset to realize the responsibility given by God concerning security and the salvation of the people/nation. · For the deputies of the Knesset to refuse to vote laws opposed to the spread of the Gospel under the pressure of ultra-orthodox parties. · For the Knesset to be cleansed of corruption and coercion. For God to intervene in every ministry and for the ruling party to realize the needs of the people and the needs concerning the security of our nation. · For our members of the Knesset to be inspired by God’s fear in the development and administration of the businesses of the country. · For social justice and against the up-surge of immorality and corruption in every level of the society. · For the protection of the widows, orphans, and foreigners in our country. · For the new generation of believers to receive a passion for the Word and a holy fear of the Lord, and that everyone would know their calling in the Lord (Proverbs 3-7). · For God to give us people and financial resources to buy and renovate our building, including the bomb shelter and the distribution center. · For strength and growth of our young church in Tel Aviv: comprised of Indians, Sri Lankan and Nepalese. Yeshua is calling us to be the light of the nations. · For our congregation to receive a new revival and for the saints to be equipped for the service and receive a true love for the one who doesn’t know God (Ephesians 4). · For the members of our congregation to be deeply healed and restored, so that they could bear fruits by catching the importance of repentance and immediate forgiveness. · For them to lean on God for everything, give up the mentality of victims and meet the living God face to face. · For the young adult group that is growing. · For our growing youth group (14-18) and their leaders. · For our soldiers, for their protection. That they will be a light to the rest of their company as well as remain strong in the Lord while on duty. · For the Jews of the diaspora to come to Israel by a desire instead of the pressure of persecution. Pray especially for the Ukrainians and French Jews and their Aliyah.